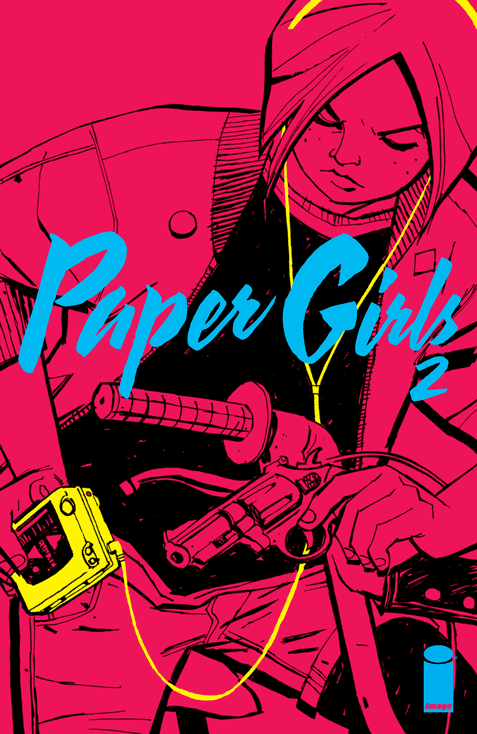 Picking up where the dazzling first issue left off, 'Paper Girls' #2 continues the strange happenings in an Ohio superb where a group of girls on their paper route in the 80's come across some strange technology and stranger beings in ninja garb. Now people are missing and monsters lurk over head as Brian K. Vaughan and Cliff Chiang deliver another intriguing and nostalgic issue full of Spielberg-esque excellence. There's an eerie sense of doom and danger complete with a sky full of monsters. The girls seek refuge at Mac's house only to encounter another dilemma altogether. Mac's stepmother, a recovering alcoholic, is drunk and muttering about the rapture befalling them. It's an unexpected turn especially with news that her husband, Mac's dad, has vanished. The scene also provides additional character development that couldn't occur with the fast-paced first issue. It also lets them gather their thoughts, think about what to do next, and let the craziness of the day sink a bit for them and the reader. Vaughan smartly puts the focus on the girls and their relationship to one another. It's the interactions and idiosyncracies between them that make the series so engaging so far. Sure, there are dark mysterious forces at work and those elements are compelling as they lurk at the edges but it's this "Monster Squad" that drive the story. Cliff Chiang and Matt Wilson have created an otherworldly appearance to this quiet suburb bathed in purples and blues. It adds a foreboding menace to the exteriors while interior scenes are bright and washed in pink tones. Chiang's character designs remain the highlight of 'Paper Girls' as they reflect the adventurous spirit, personality, and style of the 80's perfectly. 'Paper Girls' masterfully captures the nostalgia of kids-in-peril movies of the 80s with the charm and appeal that was found in the Spielberg's movies of that era. While issue two doesn't move plot very much it does make the reader hunger for more. As the mystery unfolds you can't help but root for these girls to save the world. You can't go wrong with this series.